On May 16th, 2011 Cisco and I celebrated our anniversary. I have been married to Cisco for 3 years. That seems crazy and yet it feels like we have been married longer. Maybe because I have spent almost every day together with him for the past 4 years. He is my best friend and makes me laugh more than anyone I know. Do any of you remember that i NEVER used to laugh out loud? I just had this silent shake when i was laughing. Cisco actually makes me laugh out loud. a lot. I love it. I love him. I never did write down our story of how we met so i might as well do it now. I seemed to quit writing in my journal a few months before we started dating and never seemed to pick it up again. So for those of you who don't want to read the whole story, here is the summary, met on a blind date, dated for 5 months, got engaged, were engaged for 7 months and have now been married for 3 years! You can stop reading now if you like! And now for the whole story (or as much as i can actually remember/handle typing out). 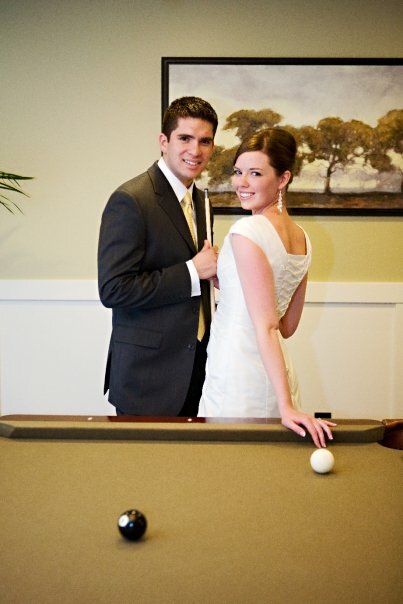 We were set up on a blind date in March of 2007 by our dear friend Lindsey Orton. She worked with Cisco at Bajio. I was almost done with my freshman year of college. Cisco was complaining to Lindsey that he was sick of all the girls he was going on dates with just wanting to get married. 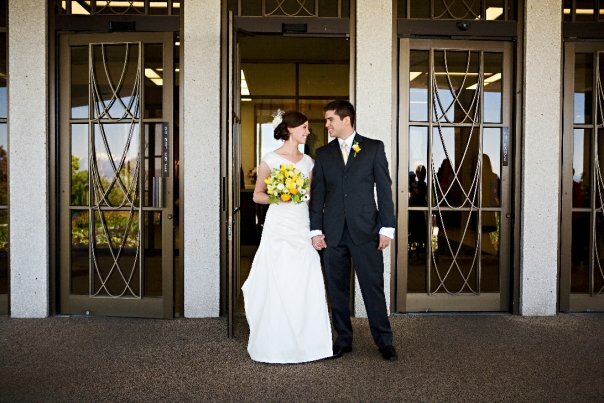 He had only been home from his mission for about 5 months and wasn't looking to get married right away. Lindsey's response was "I have a friend who doesn't want to get married!" To clarify, I didn't want to get married young. No one in my family got married young and I tended to associate getting married young with being unhappily married... Not sure where i got that idea but regardless, I had no intentions of getting married young. For my Sophomore year i planned on going on a lot of fun dates. So the pretense of us getting set up was that neither of us wanted to get married. Cisco did not want to go on the date, however, Lindsey said she had already told me he said he would go and I was excited. I did not want to go on the date. Lindsey convinced me that she had already told Cisco I would go and that Cisco was excited. To make it less awkward she got her friend Steven to double with us and we would keep it casual. About a week later Cisco picked me up in my dorm as we all peeked through the window to see what he looked like and what kind of car he drove. He was cute and I assumed he was full of himself. The date was fun but awkward because what first date isn't? We met Steven and Lindsey at Rumbi Grill and planned to watch a movie up the canyon and have a fire. This was March in Utah however so it was still FREEZING outside. After we went and bought wood at a gas station and made it up the canyon, we decided it was too cold and then proceeded to return the wood. Instead we went to Blockbuster and rented Casino Royal to watch at Steven's Grandparents house. Lets just say that it was full of those moments that we all love, like: we are sitting next to each other watching a movie, do we hold hands?? does he like me? Do I like him? All that great stuff. At the end of the night we had a good time, but no sparks were flying or anything so no plans were made to go on any other dates. We did establish a few jokes that would give us something to talk about in the future. I bet him he couldn't really eat all of his brown rice at Rumbi with Chopsticks and if he did i owed him a back rub. Something of that nature. We text each other on occasion over the next few months and joked with each other. We hung out a few times but still nothing ever happened between us. Cisco even started dating another girl for a few weeks. For my birthday I went out to Florida with my mom and dad that year and had my gallbladder surgery scheduled for the day after i got home. Things ended between Cisco and this girl while I was in Florida and although he didn't come see me while i was recovering from surgery, he did ask me to go on another date a week later on May 7th. When May 7th came around (I'm pretty sure I was still bloated from the air they pump into your stomach to do the surgery) we went and saw a movie and just hung out. I think we even went and got a shake a Denny's. We are high class. We call this our 2nd first date. or our real 1st date. two days later we went to walk his two giant labs in the park and it was like a scene from 101 Dalmatians where they were twisting us together with their leashes. My heart would beat fast every time that happened. I was twitterpated. From that day on we spent almost every day together. Now since I didn't want to get married, I just assumed we would date through the summer and then break up when school started again. About a month and a half after we started dating i remember talking to my roommates on the phone and saying, "I really fell for Cisco". They were pleased to hear that I liked my boyfriend. I was still freaked out about marriage and had a lot of insecurities about my ability to be a wife. I was scared to get married and put all of my health problems on Cisco but Heavenly Father knew what I needed and Cisco loved me. On October 11th I was at a bridal shower for one of my oldest friend, Kate Payne. All the girls there were asking me when I was getting engaged. I laughed and said we had just ordered the ring so at least another 6 weeks before we even got the ring. Oh how naive i was. The next night on October 12th, 2007 we were going to go on a double date with one of Cisco's mission buddy's TJ Ross. The plan was to go see a movie and then get some dinner. I was completely clueless. Like I said, I thought the ring was still weeks away from being finished and going on a double date isn't at all suspicious. All I kept thinking that night was "I'm not even dressed cute! I'm wearing sneakers. I hate sneakers!" TJ called us on our way to the movie and said the early show was sold out so we would have to go to the next time which didn't start for another hour. We decided to meet TJ for some food first but Cisco said it would take him a while to get to Provo so we just went to walk around the Provo Temple for a little while. Even this wasn't weird. We spent a lot of time talking or just walking around the Provo Temple. When you live in an apartment with 5 other girls, there isn't room to just sit and talk and since Cisco lived in Spanish Fork at the time, instead of just sitting in his car, we would sit on the grass at the temple. My first clue should have been that Cisco was acting so WEIRD. It was hilarious. It wasn't cold out but he grabbed a coat (which had the ring in the pocket) and was all nervous and jittery. I was still clueless though. As we walked around to the back of the temple Cisco was really getting weird when he pointed to the mountain and said "What is the name of that mountain?" um... really? haha it was a great way to get me to look in the opposite direction. Little did i know we walked right past TJ where he was setting up. When we got to the back of the temple Cisco said he had written a poem for me and this is where it hit that something was up. The poem was beautiful and so cute and I kept waiting for him to get down on one knee... and waiting... and waiting. But then his phone rang and TJ was "ready to meet us for dinner" so Cisco said we should go and we started walking back to the car. I was confused. So i assumed i was wrong and that the poem was just a random nice gesture. For the past half hour, TJ had been setting up the scene where Cisco was planning to propose. There is a huge pine tree on the side of the temple that you can stand underneath because all of the bottom branches are gone. It creates a little room. TJ had hung candles from the branches (with the Temples permission) and scattered rose petals all over the ground under the tree. As we walked back to the car i was still in my oblivious and confused state of mind so I didn't even notice that there was a tree glowing on my right side. Cisco finally had to point to it and say "What's that?" As soon as I saw it I knew what was going on and stopped dead in my tracks. Cisco had to pull me to get me walking again I was so shocked. When we got under the tree I was crying and still In shock. That is when Cisco said some really nice things (although I can't remember a thing that was said... he probably said "I love you" somewhere in there) and got down on one knee asking me to marry him. I said yes. My biggest regret is not having a camera to take any pictures! It was beautiful. We met some friends at Carrabbas to celebrate (Like Lindsey and Steven who were there when it all started) and called all of our family to tell them we were engaged. I think in those first few nights I told the story of how we got engaged at least 100 times. All my roommates knew what was going on and I got a lot of really fun reactions. I have to say one of my favorite reactions was from Alicia Wallace who lived across the hall from me. Now the reason we got married in May when we got engaged in October was because when we started talking about getting married I told Cisco that I do not handle stress well. I did not want to get married in the middle of the semester. I wanted to enjoy my wedding day. So I told him I would not get married before May and to propose accordingly. It turned out I needed a 7 month engagement to mentally prepare for marriage and i actually loved it. We didn't even talk about wedding plans for the first 2 months, we just enjoyed being engaged to each other. Everyone thought we were crazy (since our engagement was longer than some people's entire time from first date to wedding date in Utah) but it worked out for us. We were sealed in the Provo temple on May 16th, 2008 by my Grandpa Carlson. It was the hottest day of the year so far and was perfect. I loved my wedding day, loved my reception, and was so happy to be married to my best friend. We went on our honeymoon to this bed and breakfast in Midway and had such a fun time. We rented scooters and went on scooter rides up the canyon, went on paddle boats in the lake and had the most amazing breakfast brought to us in bed every morning. I have loved being married to my best friend. He makes me laugh at least once every single day. I look forward to the next 3 years and the next 50 years together. In front of the tree where he proposed. You have a great memory!! I love you! I love reading your love story!